Let’s face it, broccoli gets no respect. George H. W. Bush won’t touch it and neither will my dad. Even those of us who eat it all the time, don’t give it much thought. It’s the old reliable, always waiting in the market for that day when nothing more glamorous beckons. It’s pleasant enough when cooked properly, and no one disputes that it’s good for us with all those vitamins, calcium and fiber. Yet it’s rarely a show-stopper. What broccoli needs is a makeover. That’s just what it gets from Ina Garten, the television cooking show star known as the Barefoot Contessa. In her latest cookbook, “Barefoot Contessa Back to Basics” (Clarkson Potter, 2008), she transforms the humble vegetable from a bit player into a star. Parmesan-roasted broccoli is guaranteed to impress even the skeptics still among us. I always enjoy Garten’s cookbooks. They’re filled with relatively simple, irresistible dishes. Many recipes go over the top with butter and cream, it’s true. But this one shows a little restraint. The dressed up broccoli could turn a simple roast chicken or grilled fish into a dinner party. The flavors are vivid and the vegetable retains a bit of the crunch I like so much. Still, it’s not a major production and is easy enough for a weeknight supper. If there are any leftovers, you can chop them up and toss them with pasta. The secret here is roasting at high temperature, a technique that brings out the natural sugars in many vegetables. Garlic slices, cooked alongside the florets, contribute a mellow depth. Lemon zest and juice provide sparkle. Toasted pine nuts add a luxurious note. I’ve cut Garten’s original recipe down to serve four people and bumped up flavors by increasing the proportion of garlic, pine nuts and Parmesan cheese. In the place of basil – now out of season – I’ve sprinkled crushed red pepper over all for extra zip. Although this dish would be welcome in any season, it’s perfect for the dull, gray days of winter, when we crave something fresh, green and lively on our plates. Rinse and trim broccoli, slicing off stems about an inch below the heads. Divide the heads into florets, using a small, sharp knife to cut into the heads as necessary. Either discard the stems or, if they’re not too woody, cut them into thick slices to be roasted along with the florets. Spread broccoli pieces in a single layer on a large baking sheet. 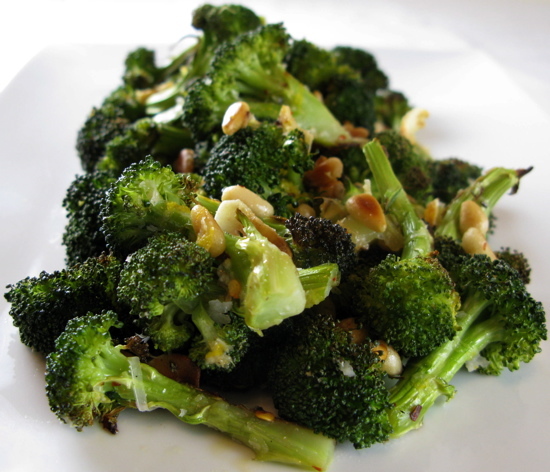 Distribute garlic slices evenly over the broccoli and drizzle florets with 2 tablespoons of the olive oil. Season with salt and pepper. Roast for 20-25 minutes, until a small, sharp knife easily pierce the broccoli and some of the florets are beginning to brown. 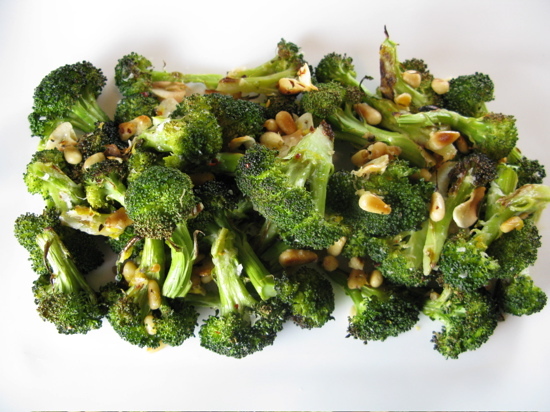 Remove pan from the oven and toss the broccoli with the remaining tablespoon of olive oil, lemon zest and juice, pine nuts, Parmesan and crushed red pepper. Serve. Sounds great. Would it work with cauliflower? I happen to have some in the fridge. This is great, you’re the Road Show of food. I don’t see why not. Cauliflower is great roasted. I might cut down on the garlic and lemon a bit, though, since cauliflower has a slightly milder flavor. This is a very versatile recipe! I threw in Brussels sprouts as well as cauliflower, and didn’t have pine nuts so I toasted pecans. Served with plain tomato and cheese lasagna.